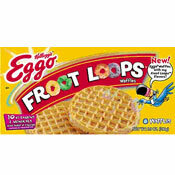 Eggo® Froot LoopsTM Waffles taste just as you might expect... Eggos with a strong shot of Froot Loops flavor. Like the plain variety, they are fine for a quick toaster breakfast, but if they were served to you in a restaurant, you probably wouldn't order them again. There's really nothing special about them. The biggest problem I had with the Froot Loops waffles was what to put on top of them. I tried a simple pat of butter. That was okay... maybe a little boring. I tried maple syrup and that was a failure. Strawberry jam worked but seemed to conceal the Froot flavor. I finally hit pay dirt with a smattering of butter and a slathering of applesauce. That combination made the waffle feel complete and seemed to accentuate the Froot flavor rather than hide it. All in all, I enjoyed my Froot Loops waffles -- maybe because they made my kitchen smell fresh more than anything. I suppose the major question I have to answer is if I would "Let go my Eggo". To which I have to say, I would not fight too hard. It's not like it's my wallet. What do you think of Eggo Froot Loops Waffles? 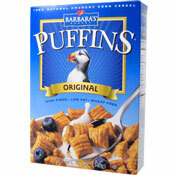 Bring these back! Every time I have an Eggo waffle, I think about these and want them so bad! To this day, I still miss Fruit Loop waffles. They have always and will always be my favorite. I was a kid when these came out - and by God, they were amazing! I have been looking for them ever since. I say we sign a petition and get these back. Make your own Froot Loop Waffles: Crunch up Froot Loops and mix them in the batter you use to make fresh waffles. I use peanut butter maple syrup with them. I want to have the Eggo Froot Loops Waffles in Quebec city. Do they still sell these waffles in stores? What are you talking about... Fruit Loop Waffles are my favorite. I am 11 years old. Fruit Loop Waffles were in stores when I was 3 years old. They are still my favorite waffles even though I forgot how they taste like. I can still remember the smell. I want my Froot Loop waffles! When I was toasting these Froot Loop flavored waffles in the toaster they smelled really fruity and delicious. However, I was a little disappointed when I tasted them. There was hardly any fruit flavor to them. I like the strawberry flavor much better. They seem to pack more of a fruity punch.